Description: Canada Air Virtual needs certified pilots to operate their Cessna's, so sign up today, fly the Cessna 172 from CYVR-Vancouver International Airport to CYYJ-Victoria International Airport and back to CYVR-Vancouver International Airport and become a certified pilot with Canada Air Virtual on the Cessna 172. Description: Canada Air Virtual needs certified pilots to operate their Beechcraft 58 Baron's, so sign up today, fly the Beechcraft 58 Baron from CYVR-Vancouver International Airport to CYYJ-Victoria International Airport and back to CYVR-Vancouver International Airport and become a certified pilot with Canada Air Virtual on the Beechcraft 58 Baron. Description: Canada Air Virtual needs certified pilots to operate their Beechcraft 1900s, so sign up today, fly the Beechcraft 1900 from CYVR-Vancouver International Airport to CYYJ-Victoria International Airport and back to CYVR-Vancouver International Airport and become a certified pilot with Canada Air Virtual on the Beechcraft 1900. Description: Canada Air Virtual needs certified pilots to operate their Beechcraft King Airs, so sign up today, fly the Beechcraft King Air 350 from CYVR-Vancouver International Airport to CYYJ-Victoria International Airport and back to CYVR-Vancouver International Airport and become a certified pilot with Canada Air Virtual on the Beechcraft King Air 350i. Description: Canada Air Virtual needs certified pilots to operate their de Havilland Canada DHC-2 Beaver Floatplanes, so sign up today, fly the de Havilland Canada DHC2 Beaver from CYHC-Vancouver Harbor Airport to CYWH-Victoria Harbor Airport and back to CYHC-Vancouver Harbor Airport and become a certified pilot with Canada Air Virtual on the de Havilland Canada DHC-2 Beaver Floatplane. Description: Canada Air Virtual needs certified pilots to operate their Bombardier Dash 8 Q-100s, so sign up today, fly the Bombardier Dash 8 Q-100 from CYYC-Calgary International Airport to CYEG-Edmonton International Airport and back to CYYC-Calgary International Airport and become a certified pilot with Canada Air Virtual on the Bombardier Dash 8 Q-100. Description: Canada Air Virtual needs certified pilots to operate their Bombardier Dash 8 Q-200s, so sign up today, fly the Bombardier Dash 8 Q-200 from CYYC-Calgary International Airport to CYEG-Edmonton International Airport and back to CYYC-Calgary International Airport and become a certified pilot with Canada Air Virtual on the Bombardier Dash 8 Q-200. Description: Canada Air Virtual needs certified pilots to operate their Bombardier Dash 8 Q-300s, so sign up today, fly the Bombardier Dash 8 Q-300 from CYYC-Calgary International Airport to CYEG-Edmonton International Airport and back to CYYC-Calgary International Airport and become a certified pilot with Canada Air Virtual on the Bombardier Dash 8 Q-300. Description: Canada Air Virtual needs certified pilots to operate their Bombardier Dash 8 Q-400s, so sign up today, fly the Bombardier Dash 8 Q-400 from CYYC-Calgary International Airport to CYEG-Edmonton International Airport and back to CYYC-Calgary International Airport and become a certified pilot with Canada Air Virtual on the Bombardier Dash 8 Q-400. Description: Canada Air Virtual needs certified pilots to operate their Embraer ERJ-145LRs, so sign up today, fly the Embraer ERJ-145LR from CYYC-Calgary International Airport to CYEG-Edmonton International Airport and back to CYYC-Calgary International Airport and become a certified pilot with Canada Air Virtual on the Embraer ERJ-145LR. 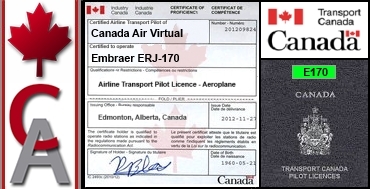 Description: Canada Air Virtual needs certified pilots to operate their Embraer ERJ-170s, so sign up today, fly the Embraer ERJ-170 from CYYC-Calgary International Airport to CYEG-Edmonton International Airport and back to CYYC-Calgary International Airport and become a certified pilot with Canada Air Virtual on the Embraer ERJ-170. Description: Canada Air Virtual needs certified pilots to operate their Bombardier CRJ-200ERs, so sign up today, fly the Bombardier CRJ-200ER from CYYC-Calgary International Airport to CYEG-Edmonton International Airport and back to CYYC-Calgary International Airport and become a certified pilot with Canada Air Virtual on the Bombardier CRJ-200ER. Description: Canada Air Virtual needs certified pilots to operate their Bombardier CRJ-700s, so sign up today, fly the Bombardier CRJ-700 from CYYC-Calgary International Airport to CYEG-Edmonton International Airport and back to CYYC-Calgary International Airport and become a certified pilot with Canada Air Virtual on the Bombardier CRJ-700. Description: Canada Air Virtual needs certified pilots to operate their Airbus A319-100s, so sign up today, fly the Airbus A319-100 from CYYC-Calgary International Airport to CYVR-Vancouver International Airport and back to CYYC-Calgary International Airport and become a certified pilot with Canada Air Virtual on the Airbus A319-100. Description: Canada Air Virtual needs certified pilots to operate their Airbus A320-200s, so sign up today, fly the Airbus A320-200 from CYYC-Calgary International Airport to CYVR-Vancouver International Airport and back to CYYC-Calgary International Airport and become a certified pilot with Canada Air Virtual on the Airbus A320-200. Description: Canada Air Virtual needs certified pilots to operate their Airbus A321-200s, so sign up today, fly the Airbus A321-200 from CYYC-Calgary International Airport to CYVR-Vancouver International Airport and back to CYYC-Calgary International Airport and become a certified pilot with Canada Air Virtual on the Airbus A321-200. Description: Canada Air Virtual needs certified pilots to operate their Boeing B737-800s, so sign up today, fly the Boeing B737-800 from CYYC-Calgary International Airport to CYVR-Vancouver International Airport and back to CYYC-Calgary International Airport and become a certified pilot with Canada Air Virtual on the Boeing B737-800. Description: Canada Air Virtual needs certified pilots to operate their Boeing B747-400s, so sign up today, fly the Boeing B747-400 from CYEG-Edmonton International Airport to CYWG-Winnipeg International Airport and back to CYEG-Edmonton International Airport and become a certified pilot with Canada Air Virtual on the Boeing B747-400. Description: Canada Air Virtual needs certified pilots to operate their Boeing B767-300s, so sign up today, fly the Boeing B767-300 from CYEG-Edmonton International Airport to CYWG-Winnipeg International Airport and back to CYEG-Edmonton International Airport and become a certified pilot with Canada Air Virtual on the Boeing B767-300. Description: Canada Air Virtual needs certified pilots to operate their Boeing B787-800 Dreamliners, so sign up today, fly the Boeing B787-800 from CYEG-Edmonton International Airport to CYWG-Winnipeg International Airport and back to CYEG-Edmonton International Airport and become a certified pilot with Canada Air Virtual on the Boeing B787-800 Dreamliner. Description: Canada Air Virtual needs certified pilots to operate their Boeing B747-400 Freighters, so sign up today, fly the Boeing B747-400 Freighter from CYEG-Edmonton International Airport to CYWG-Winnipeg International Airport and back to CYEG-Edmonton International Airport and become a certified pilot with Canada Air Virtual on the Boeing B747-400 freighter. Description: Canada Air Virtual needs certified pilots to operate their Boeing B747-400 LCF Liftmasters, so sign up today, fly the Boeing B747-400 LCF Liftmaster from CYEG-Edmonton International Airport to CYWG-Winnipeg International Airport and back to CYEG-Edmonton International Airport and become a certified pilot with Canada Air Virtual on the Boeing B747-400 LCF Liftmaster. Description: Canada Air Virtual needs certified pilots to operate their Cessna 208B Grand Caravan's, so sign up today, fly the Cessna 208B Grand Caravan from CYVR-Vancouver International Airport to CYYJ-Victoria International Airport and back to CYVR-Vancouver International Airport and become a certified pilot with Canada Air Virtual on the Cessna 208B Grand Caravan. Description: Canada Air Virtual needs certified pilots to operate their Airbus A330-200s, so sign up today, fly the A330-200 from CYEG-Edmonton International Airport to CYWG-Winnipeg International Airport and back to CYEG-Edmonton International Airport and become a certified pilot with Canada Air Virtual on the Airbus A330-200. Description: Canada Air Virtual needs certified pilots to operate their Boeing 777-200LRs, so sign up today, fly the 777-200LR from CYEG-Edmonton International Airport to CYWG-Winnipeg International Airport and back to CYEG-Edmonton International Airport and become a certified pilot with Canada Air Virtual on the Boeing 777-200LR. Description: Canada Air Virtual needs certified pilots to operate their Boeing 777-300ERs, so sign up today, fly the 777-300ER from CYEG-Edmonton International Airport to CYWG-Winnipeg International Airport and back to CYEG-Edmonton International Airport and become a certified pilot with Canada Air Virtual on the Boeing 777-300ER. Description: Canada Air Virtual needs certified pilots to operate their Airbus A380-800s, so sign up today, fly the A380-800 from CYEG-Edmonton International Airport to CYWG-Winnipeg International Airport and back to CYEG-Edmonton International Airport and become a certified pilot with Canada Air Virtual on the Airbus A380-800. Description: Canada Air Virtual needs certified pilots to operate their Bell 206B JetRanger 3s, so sign up today, fly the 206B JetRanger 3 from CYVR-Vancouver International Airport to CYYJ-Victoria International Airport and back to CYVR-Vancouver International Airport and become a certified pilot with Canada Air Virtual on the Bell 206B JetRanger 3. Description: Canada Air Virtual needs certified pilots to operate their de Havilland Canada DHC-6-300 Twin Otters, so sign up today, fly the DHC-6-300 Twin Otter from CYVR-Vancouver International Airport to CYYJ-Victoria International Airport and back to CYVR-Vancouver International Airport and become a certified pilot with Canada Air Virtual on the de Havilland Canada DHC-6-300 Twin Otter. Description: Canada Air Virtual needs certified pilots to operate their de Havilland Canada DHC-6-300 Twin Sea Otters, so sign up today, fly the DHC-6-300 Twin Sea Otter from CYHC-Vancouver Harbour Water Aerodrome to CYWH-Victoria Seaplane Base and back to CYHC-Vancouver Harbour Water Aerodrome and become a certified pilot with Canada Air Virtual on the de Havilland Canada DHC-6-300 Twin Sea Otter. Description: Canada Air Virtual needs certified pilots to operate their Basler BT-67s, so sign up today, fly the BT-67 from CYEG-Edmonton International Airport to CYYC-Calgary International Airport and back to CYEG-Edmonton International Airport and become a certified pilot with Canada Air Virtual on the Basler BT-67. Description: Canada Air Virtual needs certified pilots to operate their Learjet 45XRs, so sign up today, fly the Learjet 45XR from CYYC-Calgary International Airport to CYEG-Edmonton International Airport and back to CYYC-Calgary International Airport and become a certified pilot with Canada Air Virtual on the Learjet 45XR.